shoe addiction – I want the set! Springfield Sanctuary is in the Cotswolds and is a very special place indeed. The Sanctuary belongs to Sarah Head who has been working with herbs since 1995 as well as running herbal workshops for over five years. I’ve attended Sarah’s herbal workshops for a few years now, and during the Spring, Summer and Autumn months they are all held at the Sanctuary. May’s workshop was a joy! Aside from the sun shinning brightly on us all day, it was wonderful to be back in the dell with Sarah and my fellow apprentices. This month’s workshop was all about experiencing herbs so we drank herbal infusions, made a macerated oil, and thanks to cloud free skies we also made a flower remedy. Henriette Cress refers to plantain as a ‘wound healer’, Matthew Wood lists it as an indispensable first aid herb. The juice of plantain is cooling, it is an astringent, antimicrobial, anti-inflamatory and an anti-histamine. Plantain can be used on insect bites, it can help reduce the symptoms of allergic skin reactions, used on cuts and graze, and relief from pain and swelling. One of the simplest methods of using plantain is as a spit poultice. To make a spit poultice chew up a bit of plantain and pop it on the affected area. I’ve read a number of accounts of spit poultices being successfully used on insect bites and stings, for splinters, and for treating dirty wounds. I used a spit poultice on a friend when she had an allergic reaction to something her skin came in contact with while gardening. She instantly experienced a localised rash like reaction on her skin that was very itchy. We chewed up some plantain growing near by and rubbed it over the affected area. It instantly felt cooling and less itchy. We applied the poultice one more time and my friend felt much less irritation. Macerated or infused oils are fairly straight forward to make. The Northern European method for making a macerated oil tends to be the heat method as our temperate climate are not often suitable for the sun method. The method I used is a folk method – no measuring as such. Fill a bowl with chopped fresh plant matter and cover with a base oil. 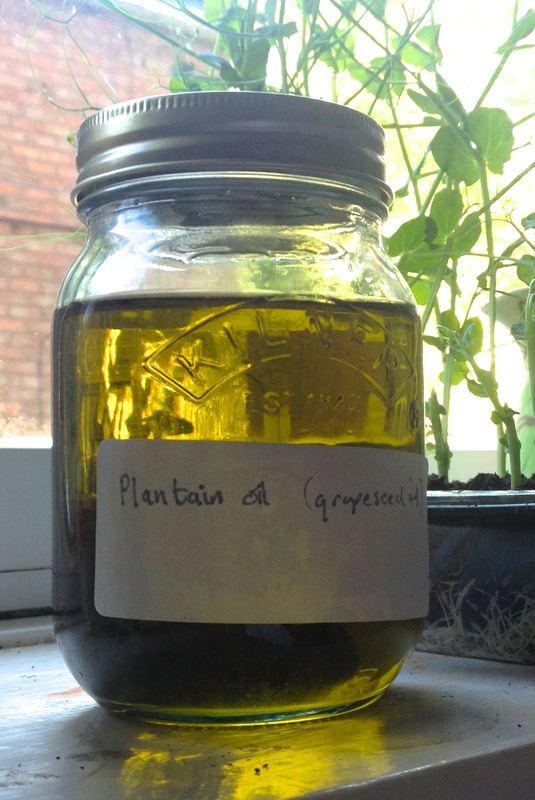 Sarah uses sunflower oil, whereas I prefer grapeseed oil as I like the way it absorbs into the skin. Use enough oil to cover the plant matter. Cover the bowl with a lid and place the bowl in the water in the slow cooker. Heat for a couple of hours and check regularly to ensure the water does not dry up. Remove the plant matter from the oil and repeat the process, adding new plant matter (hence double infused). Once the oil has been heated for another couple of hours transfer it to a sterilised jar. When using fresh plant matter allow the oil to stand for a few days before sealing the jar to allow any water to evaporate, as water in the oil the oil may turn it rancid. Store in a sealed, labeled jar, free from light. A double infused oil is for external use only.